The squirrels are quirky and cute animals but they are able to make the homeowner to go crazy with the destruction of the structures and the plants. The squirrels can eat away the sidings trying to get inside of the home so that they may build the nest. When you exclude the squirrels away from the home, it is the most practical protection that you can have against the infestation but the best way is to use the control methods like blocking of the entry points and to use the repellents in order to stop the squirrels against eating the siding of your home. Block the holes and the attic vents, gaps or the cracks in the siding and around the windows and the doors using the hardware cloth so that you can exclude the squirrels away from the home. When you prevent the entry home, you are making the siding of the home to be less desirable and they may find a new place for their nests. However, before you block the entry way, you have to ensure that there are no squirrels that are found inside your home. When there are areas that are showing the chewing signs, use the taste repellant like capsaicin. The capsaicin is the type of the chemical that it is found in the chili peppers and it is a natural substance but the animal avoid it and it can be found as granular, liquid or spray formulation. You can brush the downspouts, railings and siding on the areas where the chewing can be found in order to discourage the squirrels against climbing. The substance is sticky and it may be messy when it is time to apply it. You can reapply it on regular basis to make sure that it continues to be sticky and tacky. 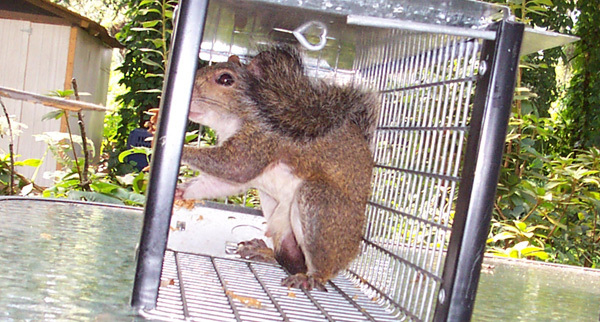 You should place the cage and the wire traps around the home so that you can trap the squirrels which chew on the siding. You may use the tap with the door on every end so that the squirrels may see through within the trap. Have bait in the trap. Go back to the How to get rid of squirrels home page.